You’ll be seeing this tag occasionally on my recipes. I’ve been invited to be a the food/homegating writer over at NFLfemale.com. I’m extremely excited about the opportunity to share Bakerlady deliciousness over there, and the chance to work with a really fantastic group of women. Head over and check out a sisterhood of women who love food and football. They have a great time supporting their teams and each other! Given that football is a raging passion in my life, a passion only matched by my loathing for ambient air that’s sticky and too hot, it’s no wonder autumn is my favorite season. And it’s here! Imagine me pulling out bins of sweaters, boots and multi-hued leafy decor right now. Dancing around rejoicing that overnight the temperature has returned to a nice healthy 65-ish with some rain. Ah rain. I’ve missed it horribly. I’m such a Seattleite. If I see 85 degrees again before July of next year, it will be too soon. Plus, there’s that glorious crisp in the air that tells folks in the Pacific Northwest that cool evenings and foggy mornings are ahead. Am I the only one who adores fog? I so enjoy watching the sun break over the evergreens, the rays cutting through a blanket of misty foggy beauty. Yeah. That’s good stuff. If it happens to be game day? All the better. Football is just better with some weather thrown in.You know what else is fantastically fall like? Chili. 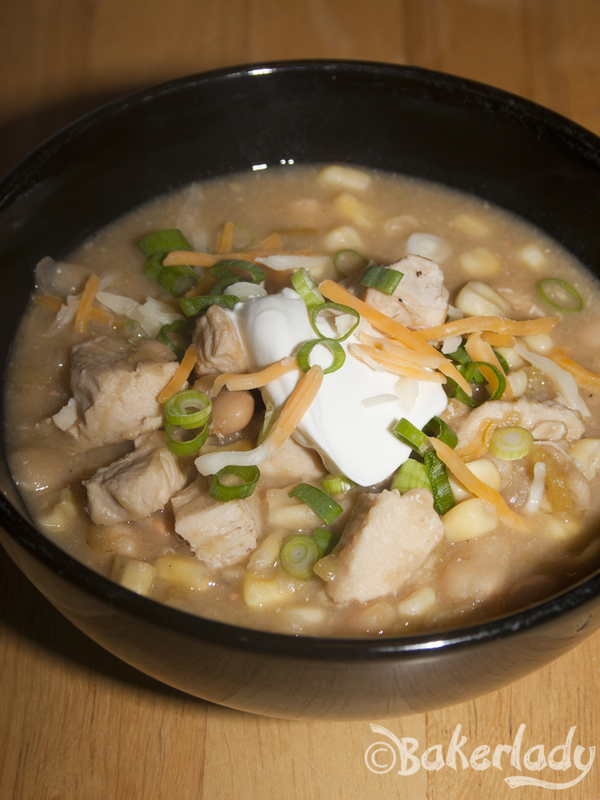 Nothing puts the topper on a good blustry autumn day than a hearty, chunky bowl of chili. With cornbread and a pat of melting honey butter. Mmmmmmm. 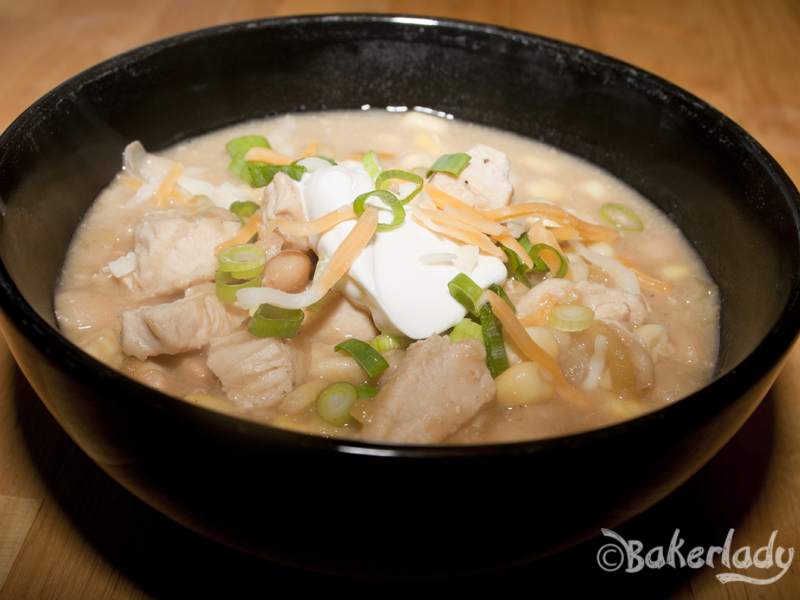 I love all forms of chili, but my favorite is this chicken and white bean version. It comes together quickly for a great weekday meal, and is a nice departure from the typical beef and kidney bean variety. A little lighter for the transition from summer to fall. 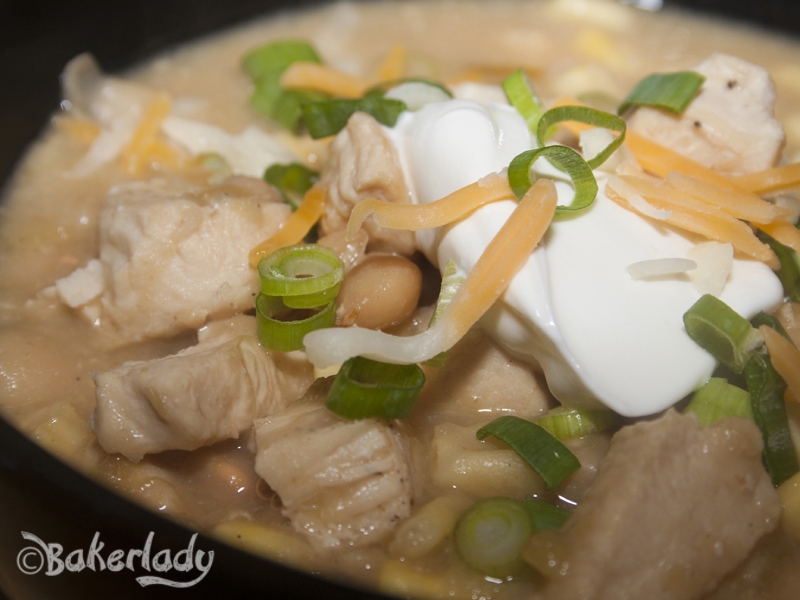 Full of tender chicken with a good strong kick of chilis and cumin swimming in a fragrant broth. As it simmers away, it fills your home with a rich spiced aroma that will have you counting down the minutes until a steaming bowl hits the table. Dinner should announce itself and draw all your family from the corners of the house, sniffing the air asking “What’s cooking? It smells amazing!”. This chili does exactly that. You’ll be the homegating MVP if you whip up a batch of this chili for a football party. Does your blood run cold as your team gives up a 4th quarter lead? This stuff will warm you back up. Stress eating as your gridiron boys mount a seemingly too last-minute comeback? Fill your belly with this chili and hang on for the ride! Go Hawks!